Quite out of the blue during dinner one evening, I asked my daughter, Lulu, aged 6 almost 7 (you may know her as the world's youngest urbanist...) if she thought she could find her way to the local swimming pool by herself. I was explaining directions to somewhere else to my son, Felix, aged 12, and I realised that all the references were visual. No street addresses or anything, just directions like "go down that street and when you see that shop, turn right...". To which he would reply, "is that the shop with the red door?" or "is that the shop across from that other shop with this or that recognizable feature?" It all originates with this earlier article here on the blog: Wayfinding in a Liveable City. So I wondered how much Lulu has registered in her daily, frequent journeys around our neighbourhood. So... I laid down the challenge to Lulu. Find your way to the swimming pool on foot. Felix and I would walk behind her but wouldn't offer any help. At six, she finds it difficult to describe how to get to places. There is no "go to the end of this street and then turn left...". It is more vague and hard for me, an adult to understand. Try it with your own kids, or other peoples' kids, to see what I mean. So we just set out on her journey, letting her show us the way. I didn't know if she could pull it off. I literally had no idea. When she was younger she was pushed through the neighbourhood in a stroller, we walk and we cycle everywhere... but always with me or her mum leading the way. It was a fascinating exercise. Felix and I watched her finding her way, looking around and using visual references to guide her. Walking up to the end of the street and scouting left and right, remembering visual clues to send her in the next direction. A couple of times I asked her, "why did you turn right here?" To which she replied, "Because that shop on the corner is where we turn right. Duh, Daddy..."
So... indeed... she was remembering visual clues like shops and trees and bushes and what not. She was pleased as punch when we ended up in front of the swimming pool. Then I asked her to find our local ice cream shop. It would involved a totally different route than our normal A to B from home to ice cream. Again, she rocked it. Using the most logical way from where were standing, instead of taking us back home and then down to the ice cream. I was impressed. 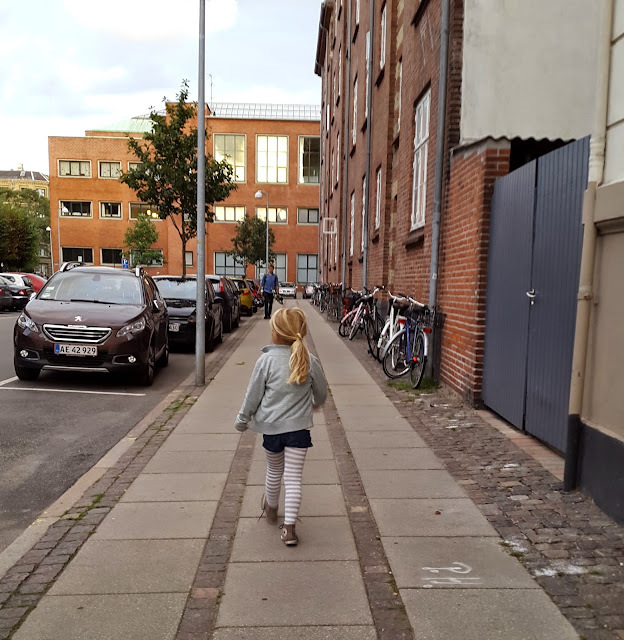 Lulu is already looking forward to when she is eight and gets to walk to school alone. It's only 800 metres from our flat. But Felix did it for the first time at eight so Lulu has it in her mind to do it at that age, too. Really, though, there is no reason that she couldn't do it earlier. Now that I've figured out that she knows her way around like a boss. Something that we often neglect to think about regarding our kids.